County commission will consider making a short-term loan to the airport. Cash-strapped due to unbudgeted expenses for the ongoing work to clean up chemical contamination in private wells, Martha’s Vineyard airport officials are seeking a short-term loan from the county. 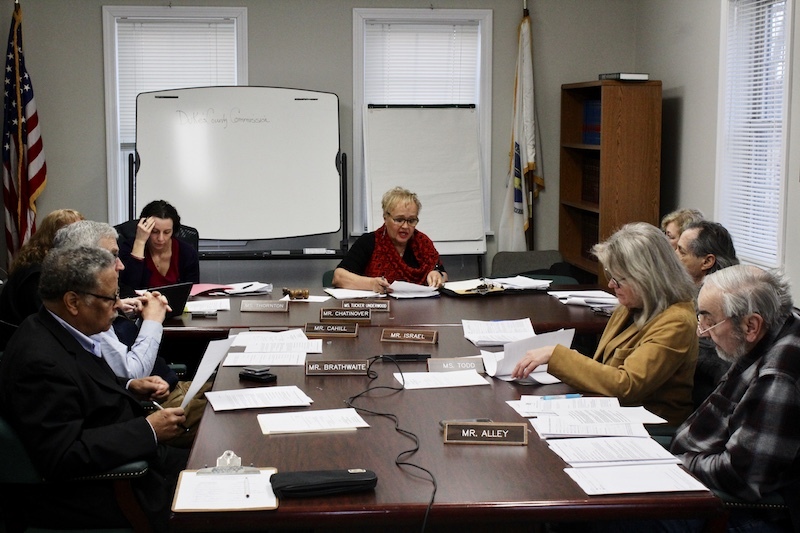 Airport commission chairman Robert Rosenbaum told the county commission last week that the fiscal year 2019 budget has morphed from a projected $360,000 surplus to a possible $350,000 deficit. Testing that began late last year found some 26 homes south of the airport had unsafe levels of PFAS — a chemical found in firefighting foam — in their wells. An environmental consultant has been hired to investigate, pinpoint and begin the work to clean up or mitigate the contamination, which was first discovered in monitoring wells around the airport last summer. Special treatment systems are being installed in a number of homes and testing remains ongoing — all at the expense of the airport. “We had a choice of sitting back and not doing anything...or take proactive measures to address everybody’s drinking water, which meant unbudgeted, significant expenses,” Mr. Rosenbaum said. He added that the airport has already spent $200,000 to address the problems and expects to need another $200,000 before the fiscal year ends in June. He said delayed federal legislation that would clear the way for a $1.3 million loan has put the airport in a further financial bind. He said the finance subcommittee had met and agreed the best solution was to request the loan from the county to cover expenses in the next few months until the federal loan is approved. County commissioners agreed to vote on the request at their next meeting on March 6. “Between now and your March meeting we are going to be working very diligently getting you in advance detailed financial information on what’s going on. We are also working to see where cuts can be made,” Mr. Rosenbaum told commissioners. County commission chairman Gretchen Tucker-Underwood asked if the Federal Aviation Administration will reimburse the airport for any of the expenses since it required the use of the firefighting foam. Mr. Rosenbaum said the FAA has been contacted about the matter, but he does not expect to see speedy action. “We believe that they should take responsibility for the financial impact . . . [but] that is not going to happen over the next few months,” he said. In other business, four candidates for two openings on the airport commission were interviewed. The county commission appoints the seven-member airport commission. The three-year terms of airport commissioners Kristin Zern and Don Ogilvie expire at the end of February. Both are seeking reappointment. The other applicants are Bob Fuller, Menemsha Blues founder and a former pilot, and Beth Tessmer, a former airport employee. Commissioners plan to vote on the appointments on March 6. Im still waiting for another Long Overdue - "Dukes County County Review Commission" to be formed again which was suppose to have happened already! It took a long time to get the previous one formed and even though it was agreed to have another one periodically I forget what the time was agreed to. I have do do more research to find out what the finale decision was. Maybe somebody out there can pick up the ball on this. And they want to spend how much to expand the airport? How to do that when you are broke? I believe the money for the expansion would come from FAA funding that would not be available without such a project. Those projects would also generate additional revenue for the airport from things like hangar rental, additional commercial space, etc. They neglected to mention the $379,000 that they have spent to date in the unnecessary law suit because of their handling of the gas station lease . It is still On going and they need $300,000 more for that court case as well. Where will that money and the damages due to the previous owner come from ???? They have a nerve asking for millions more from the Feds.